Students are the center of the college. Their needs must be identified and met through new and improved programming and excellent customer service from entry to exit. Create new programs at HCC with pathways to associate and bachelor degrees as well as direct entrance into the workplace. Develop new student services not currently provided. Communicate with students through a variety of channels. Create multiple pathways to enter, progress through, and go beyond HCC. Enhance credit programs with new credit courses. Establish a retention office staffed with retention specialists. 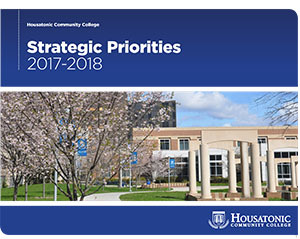 Housatonic Community College's institutional excellence depends on adhering to rigorous standards and continually assessing best practices in all areas of the college. Develop college wide initiatives to address student preparedness. Develop services to meet academic, career, and personal needs of students. Create educational excellence throughout the campus. Provide opportunities for faculty/staff to further develop levels of excellence while being mindful of the need for balance between work and release time. Improve and maintain facilities to support educational excellence. Base an advising model on best practices. Base a customer service model on best practices. Conduct an assessment of internal/external needs for new programs. Base a retention model on best practices. Examine trends to connect programs and careers. Develop a multi-faceted and integrated communication approach. Promote recruitment through a variety of external groups. Develop a comprehensive, sustainable plan in which needs of students and workplace match demands and where pathways for cutting-edge non-credit and credit programs flow to careers/employment/transfer. Develop programs based on community needs and sustainability. Develop and expand new and existing partnerships and programs including linkage between non-credit programs that feed into credit programs. Develop and expand existing and new partnerships. Adjust faculty/staff workload to accommodate program development.